WHY DO WE AGE AND WHAT CAN WE DO TO STOP IT? Our cells are programmed to die. In nature, cells of an organism replace the ones that die (or are killed). But as the organisms age, the regenerative properties decreases. And eventually, new cells are not created as fast as they are removed causing several disorders and degenerative diseases and even cancers and eventually death. It has been sometimes pointed out it’s ,more natural to die of a disease or a parasitic infliction than of old age. HOW IS GRAVITY LINKED TO AGING? Our bodies are designed to survive and operate in “Earth environment” which means everything since the time we were a zygote (the first product of egg and sperm fertilisation) to the time we die is designed in accordance to the climate we are to live in. Studies have shown that in zero gravity conditions (like the ones astronauts experience) the normal bodily functions are disrupted. On returning to the planet, they experience disorientation, reduced calcium absorption, low red blood cell count ie anemic symptoms, muscular dystrophy etc, everything consistent with the aging process. But the thing is, astronauts can recover from these symptoms quickly whereas aging people cannot. So, zero gravity condition or even a lack of “head to toe” gravity effect (bed rest condition that spreads out the effect of gravity through the chest area) cause an acceleration in aging process. It has also been pointed out by Einstein’s theory of relativity that you’ll age faster if you stand on the top of the stairs than on the ground where the gravitational effect is more. There is nothing alarming about it as its really just one billionth part of a second if the lifetime is considered 79 years. But this happens because of the flow of time. An elevated atomic clock has been found to tick faster than the one on the ground. Aging is a very complex process. It has not yet been fully understood. Like I mentioned above, cells are programmed to die. They sometimes kill themselves or are killed if they are damaged or infected. It occurs through a complex mechanism. Also many cells do not divide after reaching maturity, so, when they die, they are not replaced. The oxygen that gives life and takes it away too. The oxygen that you breathe gives you life but it also corrodes your system from within by converting itself into reactive oxygen species (ROS) a free radical that’s very reactive. It can cause impairment to the cell organelles (the tiny sub –cellular work houses of the cell that essentially allow you to live by helping the genetic material produce gene products (like RNA and proteins). These ROS along with UV rays of the sun, affect the DNA severely hampering its usual processes, including the life-saving repair mechanisms and affecting the cells in various ways (as documented below) thereby damaging tissues and organs and finally leading to diseases and death. a)DNA Repair mechanisms are damaged over time. I found a nice animated video to guide you through the preliminary process of DNA replication ie, the essential process of copying the genetic information from one cell to another (a new/daughter cell) to help us live and perform life processes naturally. As mentioned above, the cumulative processes of the damaging effects of many environmental factors, mutagens and ROS can disrupt these very processes and as a result, mistakes in coding (proper base pairing) take place that hamper the cells in a big way. The mitochondria is a small organelle present in our cells that produces the necessary energy for your life processes. The energy currency is the ATP. Sometimes, due to various reasons (ROS/ toxicity), the structure and function of these energy houses get damaged and as a result energy production is affected. This might result in impaired cellular processes and hence cellular/ process malfunctioning. These two videos (please watch in sequence if you have time) will guide you as to why telomeres (end parts of the chromosomes are so important especially when it comes to protecting the DNA and also because of their important part in the aging game. d) Cellular miscommunication and bad gene products. Just like the internet, all cells are connected with each other through a complex network that helps them communicate and “pass information”. It can be described as a lock and key model where a certain molecule like a gene product/externally administered drug/ growth hormone will fit a lock (a specific receptor, usually on the surface of the cell) and trigger a series of events like a chain reaction. So when the DNA is damaged, it might not produce the desired key molecule or may over produce it, in these cases, the trigger creates bad, bad results. Not only does the over-expression or the under-expression of gene products but also their malformation that hamper our integral systems. The protein is also known as a gene product and is vitally important for sustaining our life force. During its formation (folding into a specific ‘key’ structure), it can get damaged and therefore cannot perform its function properly. I read in this article that a group of people in Ecuador who do not have a proper signalling pathway response w.r.t. a growth hormone, do not get cancer. Since, cancer is also linked to a growth factor over expression and unregulated cell division as a result of a cascading trigger effect, individuals who do not express this growth factor due to a gene mutation do not gain height (they are up to 4 ft tall) and are immune to a variety of diseases that affects the rest of us. This area is a promising field to study anti-aging properties and also anti-cancer properties by creating artificial products that mimic their natural counterparts. 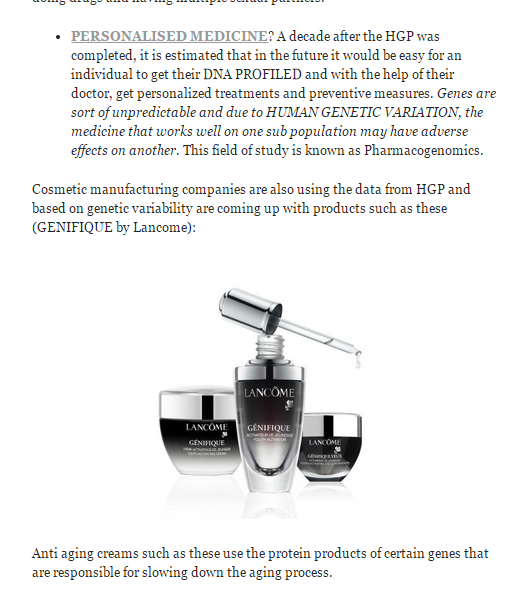 The science behind anti-aging creams. Supplementing your diet with collagen and elastin (2 proteins/ gene products) can slow the aging process. What about the much sought after stem cells? Shouldn’t they repair/replace aging tissues and organs? It has been observed that even stem cells also lose their regenerative properties when they age. You might get squeamish if you are not a non-science, especially a non-bioscience person, so you may skip this part as I have already covered everything till here. Last year, while I was a MSc student and before I applied for an internship at the Tropical School of Medicine in Calcutta, we had had the honour of listening to the founder of the research department for regenerative diseases there in the form of a departmental seminar. The speaker was a medical practitioner apart from being a brilliant researcher and speaker; he talked about how stem cells can be used to regenerate damaged liver tissues (to treat liver cirrhosis) and also aid in treating people who are close to having a renal failure. He talked about the elixir of life (in scientific terms ) and the human obsession with regeneration and rejuvenation. Strangely, he also explained the underlying principles of certain “dark arts” practices where he explained how some sects “initiate” new members by making them eat *ahem* the brain of a stillborn human child from the cemetery. (because babies=youth=stem cells= regenerative properties) and also how some old member of the sect would share a new mother’s milk (it contains colostrum that help the baby build immunity). Further more, he also explained how childbirth is an immune response of the maternal body. The fully developed fetus is considered as a foreign object and the body tries to eliminate it. It has not yet been fully understood why sperms being foreign objects are not immediately suppressed by a female immune response. The inferences regarding the dark arts maybe gross but symbolic but there’s a profound reason behind these practices. And it was enthralling to hear a renowned doctor and geneticist talk about these ideas and propel a new generation of young scientists towards a focussed work/research in the area. ©2013-2015, The Idea Bucket. Written by Ananya. The author has a masters degree in science with a specialisation in genomics and cytogentics. She is a lifestyle blogger and a freelance writer. She is studying to be a computer programmer to further her career in bio-informatics/genomics. You can contact here here: ananya.mukherjee2013@gmail.com. Previous Post: Scrumptious and easy breakfasts you would not want to miss! Thanks for liking my oil well blog. How fascinating yours is. So as we elvolve, and adapt, and mutate through each subsequent generation’s environment with new diets, new toxins, new atmospheres, etc., are we aging faster or slower as a whole? Can this be determined with accuracy? Are we also passing on damaged DNA to create increased susceptibility to mental disorders, disease, etc.? So as we evolve, and adapt, and mutate through each subsequent generation’s environment with new diets, new toxins, new atmospheres, etc., are we aging faster or slower as a whole? First off, we don’t not evolve fast enough to exhibit the stable, sustainable mutations in the immediate generations that follow as we have a relatively large lifespan. These mutations are generally easily evident in populations of bacteria because they have very short lifecycles. For us, it would take 1000s of years to make any marked evolutionary difference in our population. But if you take the Ecuadorian community I wrote about in the post as an example, there is was seen that the entire population with that specific gene mutation came from a common progenitor who had that mutation AND THE MUTATION WAS STABLE enough to be passed on to subsequent generations. Further more, it can also mean that a defect in one copy of the gene was enough to cause a deviation from the norm. Here the other gene (the copy received from the other parent) was suppressed or masked. Another point to be mentioned is there are two types of mutations that can affect your body. One that can affect your somatic cells (general cells of the body like skin cells, liver cells etc.,). This type of mutation can affect you only during your lifetime and is not passed onto the progeny. are we aging faster or slower as a whole? Can this be determined with accuracy? Human lifespan has increased because we can now cure many diseases that were the main cause of death earlier. WE have also become more conscious and aware of what’s good and what’s harmful. Since the current biomarker to calculate the aging process is the telomere, we can have statistical data concerning the recent times but since these are fairly recent developments, I don’t think we can statistically determine whether the rate is faster or slower as compared to maybe even 200 years ago. This is my opinion as far as the biomarker strategy is concerned. I guess we can calculate the data obtained from a group of individuals living in different geographical locations and having different lifestyles and get an estimate. This kind of studies is sometimes done with twins who have the same genes but exhibit different traits due to different environments. How our genes will express themselves is determined by external environments to a great degree. Are we also passing on damaged DNA to create increased susceptibility to mental disorders, disease, etc.? If there is a germ-line mutation (in some egg/ sperm cells) and is stable enough, there are high chances of it being transferred to the next generation. Now the fact remains, the mutation has to be stable enough and also whether the disease you are dealing with is caused by the alteration of a single gene/ product. Sometimes, its a complex interplay and interaction between a variety of genes/cells/organ systems in order for the disease to develop. If we are passing a defective gene that is stable and is detrimental for the child, in future we might be able to screen and alter the damaging effects by gene therapy in the unborn kids (this is currently happening but theres a lot of problems and ethical issues attached with it). There are also many gene therapy practices for cancer and other diseases but the outcome is not always desirable. Its still under works. PS: I hope I could clear some of your doubts. Would you mind if I use your questions and this response for a new blog post for people who might be interested in it as you and I are? I might be able to put in more details and pictures and all. 1) How different is human genetics from plants in that we are able to quickly genetically modify plant organisms with immediate results; but as you say, human trait change takes a significant amount of time? 2) Is it possible that human trait change is happening faster than we think, but in smaller less noticeable amounts that we only notice when we start to see higher frequencies of disease etc.? Could these complex interplays be the mutations, but, again, go unnoticed if we aren’t looking? 3) As you stated, “How our genes express themselves is determined by external environments to a great degree.” Isn’t every new birth technically a mutation of the previous DNA, and wouldn’t the evolving markers if generation previously adapting to new environments offer a slightly different DNA to each subsequent offspring? For example, we see the physical change in chickens over the course of just a few (human) generations as they go from being free-range-raised with healthy diets to being raised in dark rooms with no air or movement. Isn’t it possible we are changing faster than we think? We (Americans, can’t speak globally) can see the difference in height, weight, bone density, etc. when comparing us to our ancestry just a hundred years ago. Thanks to our external environments, technology, and diet, we are seeing some weakening in some people, some increased susceptibility to disease, and some greater instances if mental illness. Adjusting for things like the increased existence of disease in some places, are we in a kind if mutative transitional period wherein we will see humans eventually become resistant to cancers like we are more resistant to colds and flu for example? Forgive me if I missed the answers already because my terminology is more English 101 than Biology 101. I will tackle all your questions in a couple of new posts ..will put them up shortly. I’ve tried to answer all of your questions. I hope it was useful! Your blog is always helpful. Thank you! Seems like a nice product.. thanks for the link!